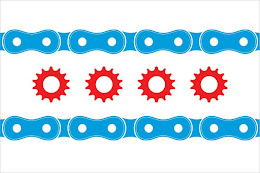 Bicycling Magazine has named Chicago one of America's Top 10 Bike Friendly Cities. According to the Associated Press, Chicago was chosen for its bike lanes, valet bike parking, indoor bike racks and other factors. The magazine also singled our Mayor Daley for his enthusiasm for bicycling. Whatever you views on Mayor Daley, one of his lasting contributions to this great city has been his vision of making Chicago the best bike-friendly big city in the world. On Mayor Daley's watch Chicago has seen a massive expansion of bike lanes and the implementation of many city ordinances that protect bicyclists. Minneapolis was first on Bicycling Magazine's ranking, followed by Portland; Boulder; Seattle; Eugene; San Francisco; Madison; New York; and Tucson.